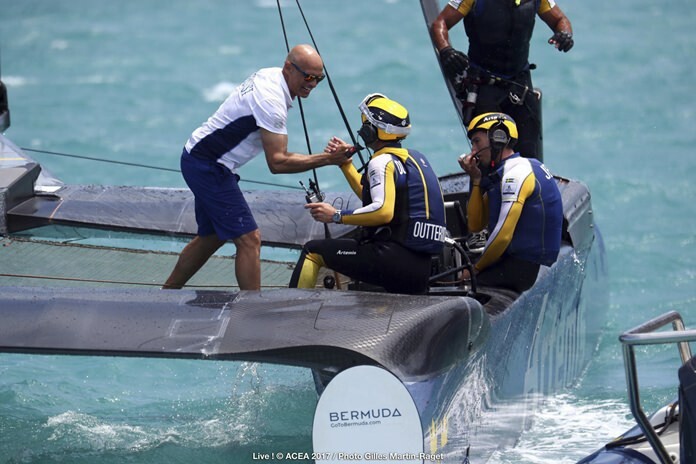 Hamilton, Bermuda (AP) – Artemis Racing of Sweden is the comeback syndicate of the 35th America’s Cup so far. Artemis skipper Nathan Outteridge aggressively sailed into the lead on the third leg Friday en route to a fourth straight victory over SoftBank Team Japan on Bermuda’s Great Sound to clinch a spot in the challenger finals. The win completed a rebound from a 3-1 deficit and represented a big step in Artemis’ road back from the tragic death of British Olympic star Andrew “Bart” Simpson during the buildup to the 2013 America’s Cup. Owned by Swedish billionaire Torbjorn Tornqvist and led by Olympic gold medalists Outteridge and Iain Percy of Britain, Artemis won the series 5-3 to move into the best-of-nine challenger finals against Emirates Team New Zealand starting Saturday. The winner will meet two-time defending champion Oracle Team USA in the 35th America’s Cup match starting June 17. Artemis started its comeback with three straight wins against Team Japan on Thursday to take a 4-3 lead. On Friday, Team Japan had the early lead but Outteridge outmaneuvered Dean Barker to take the lead after a bad tack by Team Japan on the third leg. “It’s been a very up and down road for us, but it’s nice to be hitting a bit of form now,” Outteridge said. Artemis has simplified its approach, Outteridge said, and got a pep talk from the stoic Percy, who serves as team manager and tactician. Outteridge and Team New Zealand skipper Peter Burling know each other well. Outteridge and Iain Jensen, an Artemis crewman, won the gold medal in the 49er class in the 2012 Olympics, with Burling and Blair Tuke, also a Team New Zealand crewman, taking the silver. At Rio last summer, Burling and Tuke won the gold medal with Outteridge and Jensen taking the silver. Outteridge said it’s much more than a trans-Tasman showdown between skippers. Team New Zealand won both races against Artemis in the round robins. In the first race, Artemis was penalized at the last mark, allowing the Kiwis to win. Race officials later said Artemis shouldn’t have been penalized. The next day, the rematch fizzled when Artemis was penalized for a port-starboard infraction, allowing the Kiwis to sail to an easy win. Artemis Racing was a new syndicate four years ago but was devastated when Simpson was killed when its 72-foot catamaran broke apart during a training run in May 2013. Artemis chose to remain in the 34th America’s Cup, although it missed much of the challenger trials in the 2 1/2 months it took to ready its new boat. When it made it to the starting line, Artemis was swept in four races by Italy’s Luna Rossa. Percy won Olympic gold and silver medals with Simpson as his crewman in the Star class in 2008 and 2012. Percy won a gold medal in the Finn class in the 2000 Games. Shortly after leaving its base for the race course Friday, SoftBank Team Japan hit something hard enough to jostle the crew. Divers couldn’t find any damage, but Barker said the team lost valuable preparation time. This was another painful loss for Barker. He was sacked by Emirates Team New Zealand in the aftermath of blowing an 8-1 lead to Oracle Team USA in the 2013 America’s Cup match. After the Kiwis reached match point, Oracle won eight straight races to retain the oldest trophy in international sports. Barker also skippered Team New Zealand during the loss to Alinghi of Switzerland in the 2007 America’s Cup match. Barker was part of Team New Zealand’s successful defense in 2000. Skipper Russell Coutts handed the wheel to Barker, his understudy, for the clinching fifth race.